Here is the third Asian dish. 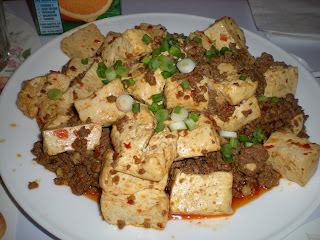 Ma Po Tofu is a famous dish in Szechuan cuisine. 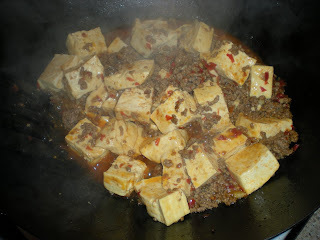 This dish is a combinaison of tofu and ground meat with spicy chili bean sauce added. 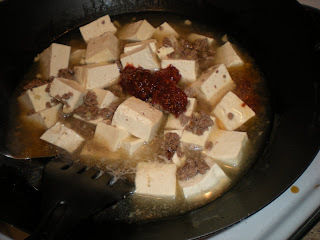 A great story about the origin of Ma Po Tofu is found on wiki. 1. 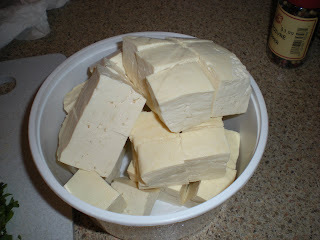 Cut each tofu block into 6 pieces as shown in the picture below. 2. In a wok or in a large skillet, heat oil over high heat. 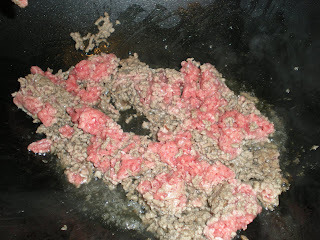 Cook ground meat until it turns brown. Add in garlic and cook for 1 min. 3. Add tofu to the wok and add water until the tofu is 3/4 covered. Add chili bean sauce and mix it with water. Stir occasionally. 4. Evaporate until there is almost no liquid (1/4 liquid left) and tofu softens, about 15 mins. 5. Remove from heat. Transfer onto a plate and add green onion on top of the tofu. Serve. Always looking for tofu recipes. Thanks for sharing.